The Ark Project: Love For Haiti is an educationally focused initiative in Haiti, that offers higher education scholarships to Haitian youth. Co-Founded by Maryanne Fike in response to the devastating earthquake in 2010, Love For Haiti seeks to support Haitian youth who show dedication and passion towards making long standing and positive impact in their communities, by providing scholarships for university and college programs. We believe that education is the foundation of any healthy and vibrant community, and that each student, given the opportunity, has the power and capability to use their knowledge for the betterment of the world. Love For Haiti also works closely alongside the Mona Foundation and the Anis Zunuzi Baha'i School near Port-Au-Prince, providing support in the Art Program, Music Program, and Teacher Training Courses. We are a team of individuals based in Haiti and the USA, with big visions for humanity! 100% of Love For Haiti's scholarships and initiatives are funded through fundraising efforts and events in our local communities. The Ark Project: Love For Haiti serves Haitian youth who show dedication and passion for making positive impacts in their community, through their academic degrees and self initiated service projects and programs. By providing scholarships for an otherwise unaffordable university degree, we believe that Love For Haiti's efforts will provide these honorable young adults with the support that they deserve, to flourish into truly inspirational and exemplary members of society. With the idea and attitude that education is the seed of empowerment, our team is dedicated to continually provide scholarships, purely through fundraising efforts and events that, in turn, bring our own local communities together. Wedsor Saintea is a second year student at the Centre d'Etudes Diplomatiques et Internationales (CEDI), and studies International Relations and Marketing Management. With a passion and desire to create opportunities for youth in his community, Wedsor dedicates his life outside of CEDI to helping youngsters develop admirable qualities such as truthfulness, generosity, purity of heart and kindness by running children's classes. In his experience, "children are neglected and have no significance in the community". His future plans are to continue his education by studying Children's Rights. Nika Apollon is 29 years old and studies International Relations at CEDI. Nika is dedicated in supporting and guiding young adults in her community, who are all too often neglected and at-risk, at this critical point in their lives. For 6 months, Nika has run Junior Youth Group programs that encourage positive and uplifting actions and the spirit of service, and focuses on empowering these youth to create their own sense of identity and nurture aspirations for a rich and meaningful future. 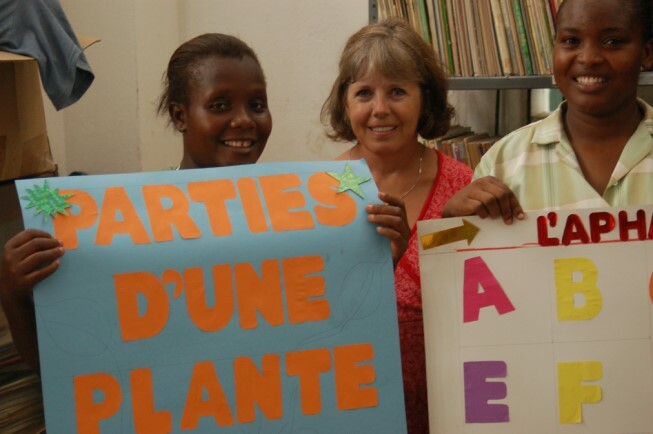 If Nika could change one thing in Haiti, it would be the education system. 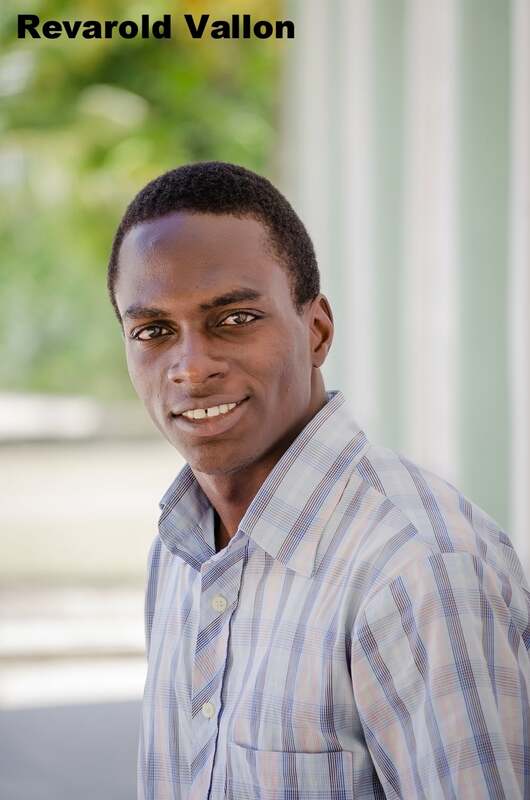 Revarold Vallon is in his first year at CEDI and is a student of International Relations, with a passion for his degree and the practice of studying. When Revarold is not at the IR faculty, library, seminars or class conferences, he dedicates his time to service projects for the betterment of his community. Using his studious methods, Revarold works closely with Nika in coordinating Junior Youth Groups, and is a member of the Statistics Committee that helps to facilitate the programs. Milene is Love For Haiti's first graduate student, having completed a 4 year course in Nursing at Universite de Port-Au-Prince. Milene is from the small town of Petit Riviere, and was brought up in a household of parents dedicated to nursing sick children to health in Haiti's capital, a two hour commute away. With such role models, Milene's deep love for children manifests in her strong will to become a pediatric nurse in her community, and educate her community about early childhood healthcare. In her time outside of nursing, Milene has started Junior Youth Group Empowerment Programs in her hometown of Petit Rivier, which nurture and develop spiritual qualities, by focusing on community service projects. Her dedication and efforts to this cause has led the expansion of this program to twelve separate groups. We are extremely proud to know Milene and will continue our support in her journey ahead! David is an exemplary individual that Love For Haiti is so proud to support. Having graduated from the Centre d'Etudes Diplomatiques et Internationales in Diplomatic Studies, David has come to believe that the youths of Haiti have the will and potential to learn and to create a better future for themselves and their country through education. Having grown up in a single-parent family of a mother who was dedicated in raising and educating David and his brother, David's belief has instilled within him a strong desire to prove himself, resulting in a scholarship that supported him through his high school years. With Haiti's declining economic state and University education increasingly becoming a "luxury", Love For Haiti is proud to say that David's academic future has had the opportunity to blossom with our scholarship. "There is a proverb in my country...pa janm bliye premye lapli kilevel mayi...Never forget the first rain that made you grow. None of the recipients [of the scholarship] will forget your support". David Menard graduated in 2014 and now dedicates his time to service projects in his community. He also works with air traffic control at Port-Au-Prince International Airport. Established in 1982 on the out-skirts of Haiti's capital, Port-Au-Prince, the Anis Zunuzi Baha'i School is a primary and secondary school that provides access to quality education for the poorest of Haiti's children. With 300 current students attending between kindergarten and grade 13, the school follows the national Haitian program with an emphasis on moral education, to empower the children and youth by fostering cooperation and a spirit of service. In the aftermath of the 2010 Haiti Earthquake, a group of friends, doctors and like-minded individuals traveled from the U.S to the heart of the devastation with the aim of helping in any way possible. This was the inception of Love For Haiti. It was at the Anis Zunuzi Baha'i School, where the group set up a hospital to aid the injured and homeless citizens of a nation brought to its knees. Since that time, a very special relationship has developed between the Anis Zunuzi Baha'i School and Love For Haiti, with the team visiting the school multiple times a year. With a flourishing Art and Music Program, students at Anis Zunuzi Baha'i School are provided with a well rounded education of academia and the arts. Our team at Love For Haiti are proud to support the Art and Music Programs by collecting instruments and art supplies generously donated by members of our local communities in Hoboken and Jersey City, New Jersey, and hand delivering them to the students at Anis Zunuzi. Collaborating with bwè kafe, a Haitian inspired coffee shop, all donations and instruments are collected at the Hoboken and Jersey City locations. Please follow bwè kafe on Facebook, Twitter and Instagram for updates on our next Haiti trip! Otherwise, please feel free to contact our team.